No type of retirement account, anywhere in the world, offers as many benefits to the typical middle-class investor as the Roth IRA does when used correctly. By taking advantage of a Roth IRA you are probably going to build wealth faster, and keep far more of your income, due to the myriad of tax advantages it has built into the bankruptcy and tax laws of the United States. The Roth IRA may be the closest thing to the perfect tax shelter you will ever experience or need. For precisely this reason, Congress is strict about the amount of money you can contribute to it each year. With a Roth, you pay no taxes on your dividend income, your capital gains income, your interest income, or your rents. Those advantages alone make it easy for a Roth IRA to crush a regular brokerage account, as well as trounce 401(k) plans, the biggest advantage of which is often the matching funds that come from your employer. When your assets reach sufficient size, you can even begin managing your Roth IRA as a self-directed Roth IRA account, and use it to buy entire apartment buildings or, in some cases, minority stakes in private businesses. The account can grow right along with you, whether you want to own corporate bonds or develop a hotel. You can even tap into a Roth IRA without penalty to buy your first home or, in some cases, fund a medical emergency. If you absolutely must, you can even withdrawal past principal contributions you've made to your Roth IRA without suffering the massive taxes and penalties that you would face with Traditional IRAs and 401(k) plans. Say you are 18 years old, and you plan on working until you hit age 65 and then you'll retire. You meet the love of your life right out of high school and get married. The two of you decide that you don't need to be rich, but you do want to be secure. You stick to one, single rule throughout your entire career: No matter what happens, in prosperity or poverty, you will fully fund your Roth IRA up to the contribution limits each and every year. No matter how desperately you need that money, you will never touch it; instead, you will protect it and allow it to compound tax-free. In the first year, the most you can each put away into your Roth IRA is $5,500. Between the two of you, that is $11,000, or $916+ per month. You buy used cars instead of new, clip coupons, and eventually, earn more as you work your way up the career ladder. What could you expect? Based on the historical returns generated by stocks for the past century, assuming you reinvested your dividends, you could have upwards of $9,591,723 when you went to retire. Taking the same inflation rate experienced over the past century, as well, that works out to roughly $1,500,000 in today's purchasing power. After all, it's purchasing power that counts. You could convert that $1,500,000 into a stream of annual passive income ranging from $50,000 to $75,000 tax-free in today's dollars. You'd never need t touch the principal. You could live well for the rest of your life, statistically, another two decades at least, and probably longer if medical science continues to improve over the next half-century, and never touch a penny of principal. Instead, when you died, the money in your Roth IRA could be put into trust funds for your children and grandchildren, or given to charity. 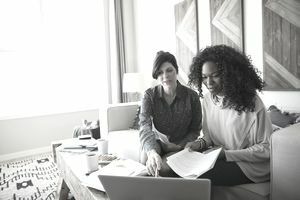 Since a Roth IRA is a type of an account, rather than an investment itself, much like a savings account or brokerage account, it can be opened at nearly any mutual fund company, stockbroker, or, in some cases, even a bank. With a bank, however, your investment options would be limited to certificates of deposit, which probably isn't a good long-term strategy since you have very little chance of beating inflation with CD interest rates. Make sure to watch out for fees, though. You should not be giving up a considerable percentage of your assets or pay high commissions. The younger you are, the bigger bite those fees take out of your family's future wealth.